Thank you Stonyfield Organic and Wal-mart for sponsoring this post. 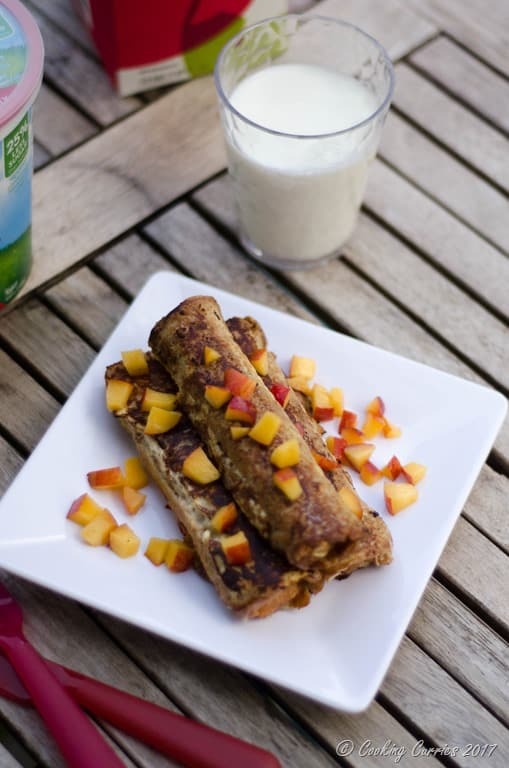 A quick and easy breakfast of peach filled French toast roll ups made with Stonyfield Organic Vanilla Yogurt, that little hands would love to pick up and eat all by themselves! 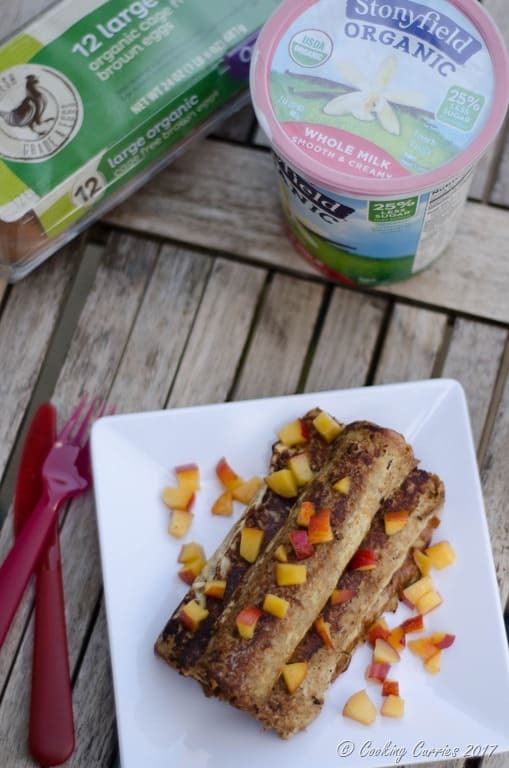 As part of the Stonyfield Clean Plate Blogger Club, I get to work with various different partner brands and its always so much fun, learning about new products or something new about products and brands that you already know of. This month, when I got the opportunity to work with Stonyfield Organics’ partner – Wal-Mart, I was pleasantly surprised. I got a gift card to go shop at Wal-Mart for Organic products and man, I was blown away by the choices. Our closest Wal-Mart does not carry produce, but I was very excited to pick up some Organic Milk, Eggs, Bread and of course, Stonyfield Organic Yogurt from there. Now, with a basket of all this, it was like a mini Chopped challenge. Bread and Eggs and Milk – you would think of French toast, of course. But I wanted to do something different with it. I made a French toast, French Toast Roll Ups, to be exact, but I made it with yogurt instead. Essentially just 4 ingredients, if you don’t count the fruit filling. Vanilla yogurt and eggs were beaten together to dip the bread in. I rolled up fresh peaches into the bread, dipped it in the yogurt-egg batter and pan fried it with butter! 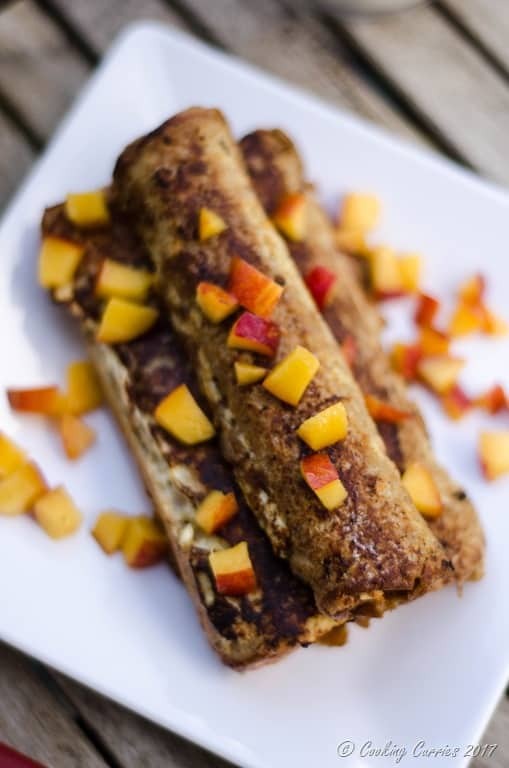 And Ta-Da, just like that, in a matter of minutes, delicious Peach Filled Vanilla Yogurt French Toast Roll Ups are ready for breakfast, for the little guy! He loved it!! 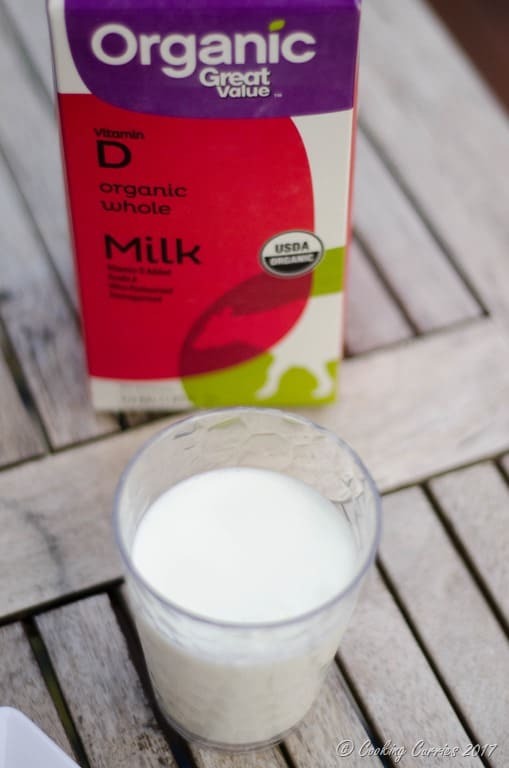 And a glass of Organic Whole Milk sealed the deal for a filling and nutritious breakfast, that this mama was happy about! Roll the bread slices to be a little thin. Spread about a tbsp of vanilla yogurt on one side of each slice. 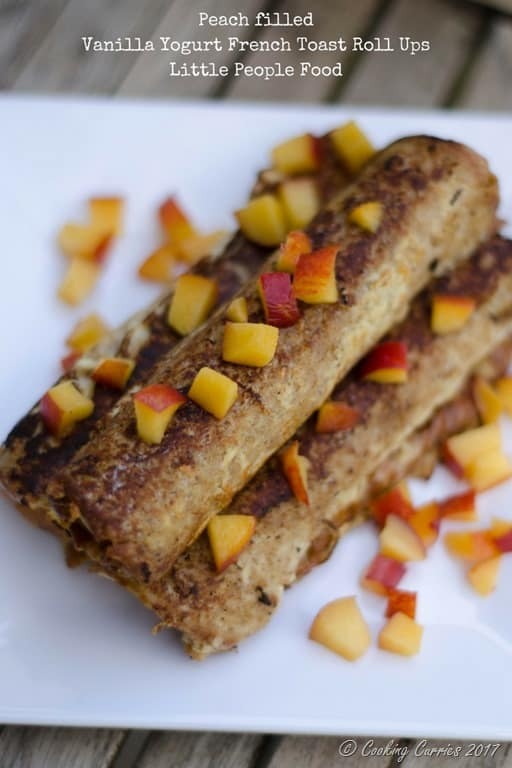 Divide and sprinkle the chopped peach slices over the four slices of bread. Beat the eggs and the remaining yogurt together and keep aside. Roll up each of the bread slices and seal the edge with a little of the yogurt egg mixture. Heat butter in a skillet over medium heat. Add the roll ups to it. Turn them around until crispy on all sides. Serve with more chopped peaches or a dollop of yogurt on top.